This movie is awesome and you should go see it right away. I cried and cried for the last 15 minutes, I was so happy. lawless523 had a post about Jesus Christ Superstar and Godspell (and Jethro Tull's Aqualung). Godspell was composed by Stephen Schwartz, who also did Pippin. Pippin has always been one of my favorite shows. I'm not under any illusions that it's a classic of the American Broadway Musical genre, but the loopily sinister hippy-carnival/medieval costumes (original designs by Patricia Zipprodt) and the pop-y songs with their loving nods to classic U.S. showbiz tropes, have always made me happy. If I wanted to learn more about the canon for Black Widow and Hawkeye, what should I be reading? Are there collected comics volumes available? I enjoyed the Avengers movie a lot, but I don't feel that I know enough about the characters to write them, for example. 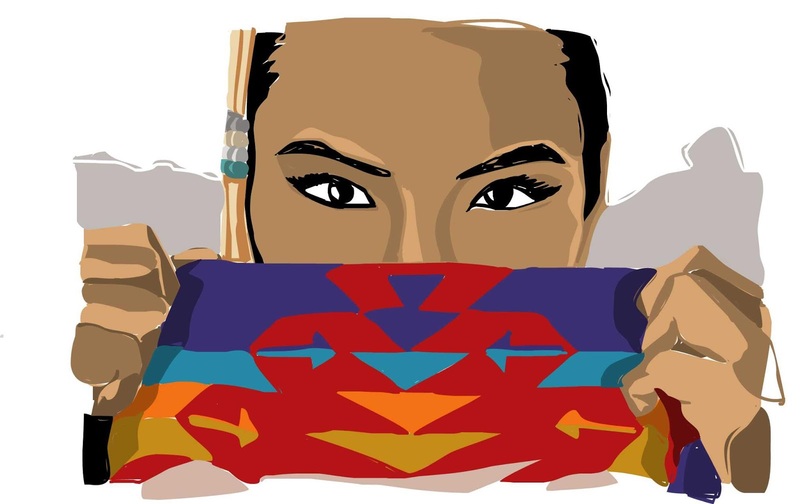 Dine (Navajo Nation) filmmaker Brian Young is trying to get his animated film off the ground. See more (and back the project) at Kickstarter. We finally saw this! Helluva movie, innit? I am not going to do much of a plot + critique writeup because it seems that everyone all over the Intarwebs has already done so, week ago. In a nutshell, Loki (yes, that Loki) steals a strange, powerful McGuffin artifact from a secret lab on Earth and plans to trade it for an invasion force of aggressive aliens. Nick Fury of the spy organization SHIELD assembles a Ragtag Bunch of Misfits response team consisting of the Black Widow, Captain America, the Hulk, Iron Man, Hawkeye (eventually), and Thor (who is, as you may recall, Loki's brother, or half-brother, or adopted brother). Major mayhem and hundreds of explosions ensue. One striking thing that many have noted is the lack of classic intrusive male gaze in the movie. There are a number of fan service-y, shots, but the men get them as often as the women. And among the women, the usual camera target is Fury's deputy, Agent Maria Hill, rather than the Black Widow, who gets to play as one of the team to a degree that made me very happy. No, it's not perfect in that regard (as has been noted, despite several named female characters, the movie does not pass the Bechdel Test), but what is? This was visually very beautiful and quite funny (in a very-young-child way). It also managed the feat of being cute without being sappy - even my cynical husband said so! Part of this is due to some rather scary scenes, but I didn't hear any whimpers or crying from the small children in the audience this afternoon. In fact, as smillaraaq remarked, the tots all seemed to be mesmerized into silence. Sosuke, age 5, lives in a house atop a cliff overlooking the sea. His mother Lisa (!) works in a senior center next to his school, and his father is an officer on a ship whose route often passes below the house. One day, in the shallow water at the cliff's base, Sosuke finds an odd-looking fish stuck in a jar. He rescues it by breaking the jar, names it "Ponyo," and starts toting his new pet around in a bucket - even to school. What Sosuke doesn't realize is that Ponyo is in reality the daughter of a half-mad formerly human mage whose job is keeping the ecology of the sea in balance. He'll stop at nothing to get her back - but he is not the only major power in play in this story, and Ponyo herself is a force that can't be ignored. I think I saw a visual homage to Spirited Away during the rather mystical final section of the movie, but The Mr. disagreed. I also have to add that there was a realism I really appreciated about the depiction of Lisa's situation, as the wife of a man who is often away from home, and that the eventual happy ending is happy for her as well. Official movie site with trailer here. Just got back from seeing this with my family, the Young Lady's best friend, and smillaraaq. I'm not doing a huge review, because I'm not a huge movie person ... but I enjoyed it. There was a certain amount of horrific nastiness, but most of it was over in about the first 25 minutes of the film. And yes, it was violent, but of the type of violence that any shounen manga fan would find quite resonable. A couple of little points, some thoughtful, some just silly ... Ron Perlman really inhabits the character of Hellboy (note: I did not see the first movie). You only have to compare his performance as the adult Hellboy with that of the competent young actor who played the juvenile Hellboy in the introduction. I was constantly aware of the kid's makeup as makeup, but I completely stopped thinking about it with Perlman after the first minute or so. And he is such an excellent character for me, so reminiscent of so many wisecracking RPG sessions and snarky manga heroes. But when he starts trying to be friendly with the average man in the street, and fretting over why people don't like him, I whispered to smilla that he reminded me of a very large, red Goku. And she whispered back that his friend Abe Sapien was clearly Hakkai. And it was so true. Although when both of them get sloshed about halfway through the flick and started sappily maundering about love, the dynamic began to get more like just-buddies Gojyo and Hakkai. See, everything comes back to Saiyuki eventually. Anyway, the whole thing rattles along at a marvellous pace - I couldn't believe nearly two hours had passed when the credits began to roll. Step right this way for stuff the likes of which one formerly had to attend a con to get ... T shirts, key chains, necklaces, and wristbands, now coming to your favorite shopping mall courtesy of Hot Topic, the boutique beloved by wannabe Goth guys and gals. To give Hot Topic credit, I do have to say that they were also the only place where you could get T shirts for Neil Gaiman's MirrorMask. It's probably just me, but somehow, everytime I see a still of Jodie Foster in her new journalist-turned-vigilante flick The Brave One, she seems to be channeling her inner Sanzo - at least enough that she could do a helluva job cosplaying him ... .
Actually, I quite liked it ... but (1) I've almost given up expecting much from the actual book series, and (2) I've pretty much forgotten what happened in the book. So your reactions to the movie might not be the same as mine. You may recall the travesty that was the Earthsea television special. You may also recall the joyous news that Studio Ghibli (best known for Miyazaki-sensei's films) was going to make an Earthsea movie, and then the much less joyful news that it was Goro Myazaki (Hayao's son) who was actually going to be making the movie. More recently, Oyceter brought to my attention the fact that in the Ghibli movie - as in the TV mess - everyone is white. > sigh < With that in mind, having stumbled over a link to the Australian website for the Ghibli movie, I thought I'd post it here so people can see the trailer etc. if they haven't had that chance. And for good measure, here's Le Guin's commentary on the film, which also mentions why we won't be seeing it in the United States anytime soon.